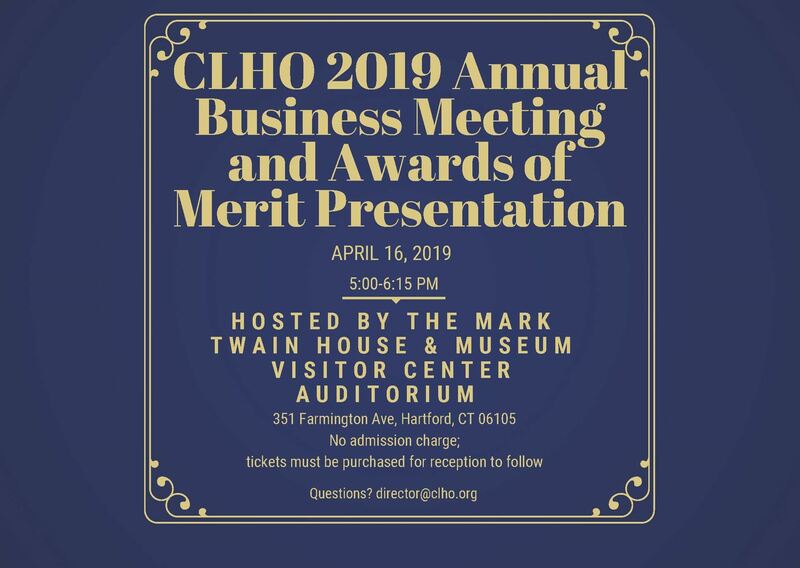 The Connecticut League of History Organizations presents Awards of Merit to institutions and individuals who demonstrate the highest of professional standards, and who enhance and further the understanding of Connecticut history. 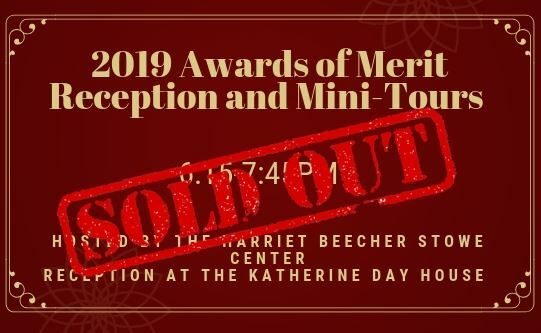 The purpose of the Awards of Merit is to recognize the care, thought and effort invested in these contributions and to inspire and encourage others by acknowledging exceptional contributions to state and local history. The mere fulfillment of routine functions does not justify an award. Action over and above the ordinary call of duty is prerequisite for an Award of Merit. Project: exhibition, restoration, preservation, special research, web site, etc. Publication: book, exhibition catalog, video, DVD, newsletter, pamphlet, etc. Educational Program: for schools, children, adults, groups with special needs, lecture series, demonstrations, Power Point presentations, etc. Individual Achievement: an individual’s long-term efforts towards promoting and furthering a knowledge and appreciation of Connecticut history. History organizations are encouraged to nominate their own work, as well as outstanding contributions by neighboring organizations. Individuals may nominate their own work, with the exception of the Individual Achievement award. Only works completed in the preceding 18 months are eligible for nomination. Nominated works must be historically accurate, properly documented, easily used and understood, and have specific goals. Nominated books should contain accurate citations, an index and a bibliography or list of works cited. Project nominations must contain photographic, video or other documentation of the final installation. All nominations must include an accurate budget, showing sources of funding, expenses incurred and relationship to institutional budget. The CLHO’s Awards of Merit Committee reviews all nominations. The committee is composed of at least five individuals representing different areas of expertise and different size institutions, including volunteer and non-volunteer organizations. The CLHO continually searches for outstanding new ideas that might serve as a model for other societies, and the Awards Committee will consider nominations that use models developed by other organizations but improve and carry such models to a higher level of excellence. The Awards Committee may give more than one award or no award in any category. Incomplete nominations will not be judged and will be returned to the nominator. Decision of the Awards Committee is final. One (1) digital application on a thumb drive or sent via e-mail to info@clho.org. (Note: Special exception may be made for non-electronic application submission by consent of the committee. Please note this will only be made if electronic submission is not physically possible. Applicants must contact Christina Volpe at director@clho.org, (860) 832-2674, to request permission and instructions on submitting a hard-copy application. Digital files should be submitted as PDF files, Microsoft Office compatible files (Word, Excel, PowerPoint, etc.) or jpeg/PDF files (for images). Digital images should be sent at appropriate resolution levels. For publications, the physical project (book, DVD, etc.) must be submitted in addition to the digital applications.